The global connected living room market is expected to experience high competition owing to the presence of a large number of players in the market. The leading players are putting efforts in research and development activities to come up with new products and update the existing technologies. In doing so, they are aiming to gain competitive edge in the global connected living rooms market. According to Transparency Market Research (TMR), Samsung Electronics Co. Ltd., Eaton Corporation, Seimens AG, General Electric, Schneider Electric SE, and Rockwell Automation Inc., are some of the leading companies operating in the market. In addition, growing investments in mergers and acquisitions have also resulted in growing the capabilities of players, thus flourishing the market in coming years. 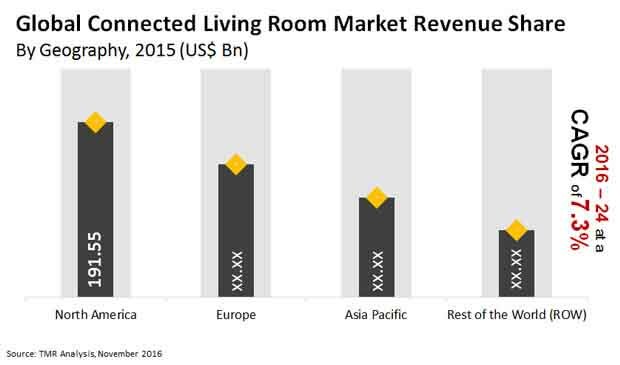 As per TMR, the global connected living rooms market is expected to reach US$ 984.5 bn by the end of the forecast period 2024, from US$ 518.9 bn in 2015. The market is expected to rise at 7.30% CAGR during the forecast period between 2016 and 2024. On the basis of components, the communication devices segment is estimated to lead the market. This segment is estimated to rise at a CAGR of 7.2% during the forecast period. The increasing use of computer modems, Bluetooth, infrared networks and cards, and equipment used for enabling Wi-Fi are the major factors that will help in leading this sector. On the basis of geography, North America is leading the market owing to high investments done in latest technologies by the people in this region. Owing to implementation of technological advancements, the lifestyle of people have changed. Governments across nations are putting efforts to encourage digitization, which is likely to increase the adoption of these technologies. Some of the major factors that will push the demand for connected living rooms market on an international level. Increasing efforts in research and development activities that will further benefit the players to bring new and more updated technologies in the market. Furthermore, changing preference of customer across the globe to use advanced technology and rising preference towards high tech electronic devices has significantly aided growth of this market. Nowadays, various electronic devices can be connected to each other such as, TVs, fridge, mobiles, laptops, washing machines, and various other. These interconnectivity and ease of living will fuel the demand for connected living rooms market globally. On the other hand, as this market and the technologies used in it are in its nascent stage several restraints may hamper the growth of the market. To state some of the restraining factors, low awareness and high installation cost may hinder the market to gain its momentum. Several issues related to compatibility and intellectual property rights are expected to hamper the growth of global connected living rooms market. However, as the market will get mature and further research and effort taking place in the market will minimize these restraints in coming years. In addition, increasing global penetration for advanced technology especially in the emerging economies will overcome these obstacles.